The number of people using RTI Act and the number of applications filed indicate the growing popularity of the act as a tool for bringing trasparency in public administration. 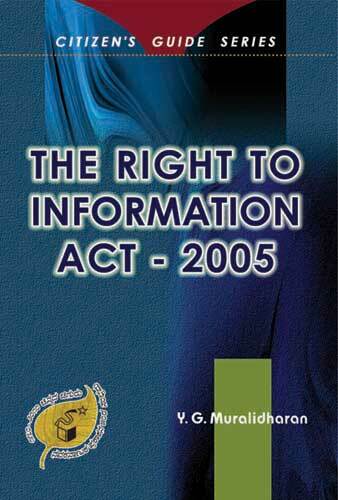 In this view, it is hoped that this guide will help the citizen in understanding the framework of the RTI act and the procedures involved in making an application. Shri Y G Muralidharan is a well known consumer activist and is engaged in other civic issues like right to information, public service laws, human rights etc. He has trained over 5000 Public Information Officers. He is a prolific writer and has over 3000 articles to his credit. He writes weekly columns in two leading Kannada newspapers. Shri Muralidharan has over 25 books to his credit and a majority of them have been published by Navakarnataka publications. He is a well known speaker on issues of contemporary interest. His books on Lokpal, Right to Information and Personality Development have seen several editions.